Delos' most crucial directive to Charlotte Hale on Westworld this season: Find Peter Abernathy, a glitching droid and the company's most valuable asset, with about 35 years of vitally important park data stored inside him. The problem is that Abernathy's past builds were never fully wiped, so he still retains enough of his cannibalistic persona The Professor to continue menacingly quoting Shakespeare, John Donne, and Gertrude Stein, and enough of his rancher father role to remain bonded with his daughter and leader of the robot uprising, Dolores. This is not a host who will come along quietly, despite being overwritten with a new persona of a mild-mannered commuter who just has to catch a train. 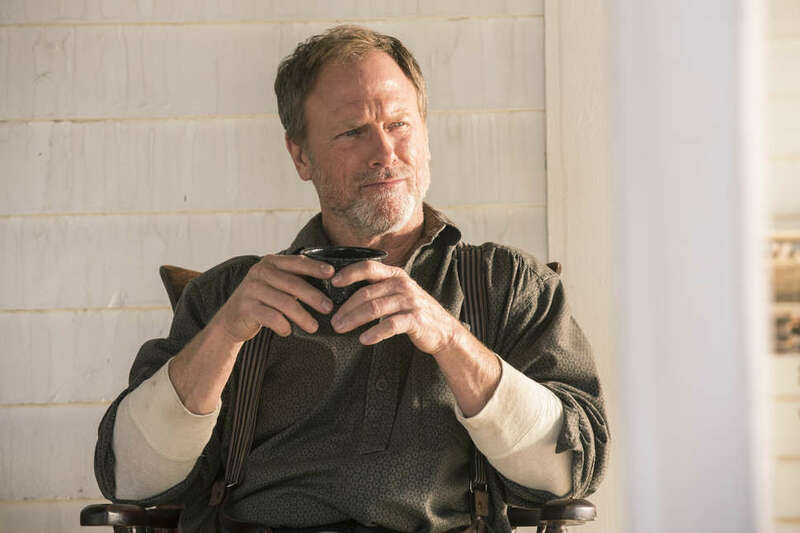 For that aspect of his character, actor Louis Herthum tells Thrillist that he channeled his inner Dustin Hoffman. "I felt like Rain Man," he jokes. "'Yeah, train, got to get to the train. Yeah, train's good. Walmart. K-Mart. Train.'" We know that that Delos is refusing to send in a rescue party to save the humans until Charlotte secures the data inside of Peter and transfers it to the mainland (although we also know from Episode 1 that help arrived two weeks later). For now, there's still a lot we don't know, such as how exactly Peter or his cache of crucial code will be used. With Westworld being stingy with divulging those secrets, Herthum did his best to share with us what he could about his role's significance, including his thoughts on the park's personal-data-mining operation, as well as what it was like baring all on his first day on set. Thrillist: There's a moment in this episode where Peter quotes Gertrude Stein: "What is the use of a violent kind of delightfulness if there is no pleasure in [not getting tired of it]?" That choice of quote makes it seem like Peter is processing or commenting on the trigger code "These violent delights have violent ends." But how did he even get that code in the first place? Louis Herthum: Wow. You're the first one to ask me this. This is a bit of a mystery because the trigger code, somebody had to have placed that in there. The question is, how did the photograph [he finds in the Season 1 premiere] trigger the glitching, and to the point where he would give Dolores the trigger code? Now, most people think it's because he sees a photograph of a woman in a modern setting, and he does say, "Have you ever seen anything like this place? Where is she?" So the question is, is it seeing that girl, who, as it turns out, is James Delos' daughter, Juliet? But way too many people forget this, too: In Episode 2 of this season, William says to Dolores, "I think there is an answer in here to a question no one's ever dreamed of asking," and Peter, he had said, "I had a question... a question you're not supposed to ask -- which gave me an answer you're not supposed to know." That's when he says, "Would you like to know the qu-qu-question?" William saying something very similar to Dolores this season. That is key, somehow. I don't know how, though. I don't know! [Laughs] I don't get many notes. When you were shooting the scene with the photo, did they tell you anything about its significance? Herthum: Nothing. And it was a different photo at the time. And this is how astute the fans are -- when fans first looked at that photograph, there was a corner of it sticking out of the ground, and you can see a tiny little section. People blew that up, and figured out that it was a shot of the Golden Gate Bridge. It was a couple standing on the bank in San Francisco, with the Golden Gate Bridge in the background. They switched the photo between production and airing, and put that girl in there. Jonah Nolan directed that episode, but he told me virtually nothing about the photo's significance: "You've been sitting out here all night. Clearly, it's confusing to you." As far as the trigger code, I think that was told to me on the set: "This is what you're whispering to her." Clearly, Peter knew a lot more than I did. Does Peter still have all that data inside him? Or did Bernard steal the code before Charlotte's men arrived? Herthum: I don't know! [Laughs] Bernard was already unstable. But Peter is acting the way he is because he's got all of that data inside of him, and the size of that data -- "35 years of vitally important data" -- is more than the host constructs. It's the data that they got from the guests as well. Behavioral type stuff? DNA files, I guess? When they downloaded all of that, I don't think this made the final cut, but Charlotte Hale told [Lee] Sizemore that he'd only have about 5 megabytes left to give Peter a personality. That's all that would fit. So if Bernard had all that data in him, he wouldn't function any better than Peter was. That would be my guess. It's interesting, though, because this all connects to this season's larger theme of personal data collection. Herthum: How about that?! I keep saying, "Westworld is a cautionary tale." There's no way that they could have known what was going to happen with Facebook and Cambridge Analytica, because we shot all of this months ago. I was like, "My God, these people are brilliant." I had people gathered to watch the first episode of Westworld, took a photograph, put it on Instagram, which also copied to my Facebook, and a couple of people said, "Tag me on that." So I went to my computer, and it had only been there for less than a minute, I put my cursor over the faces of these people, and it recognized them! Instantly! It said, "Do you want to tag Sean? Do you want to tag Brett?" And that's the first time that I realized that Facebook has face recognition. And the whole thing with getting the guests' DNA. Being fingerprinted used to be a bad thing: "Oh my God, I got arrested, and I had to get fingerprinted." Now we just give it to them. I have a 23andMe DNA kit, and I have an AncestryDNA kit, both that were gifts, and I haven't done it. If you read the privacy disclosure thing, it's like, not private! [Laughs] It's like, "We might use this." I went to Century City [in Los Angeles] to meet somebody for lunch, paid for my parking, and when I pulled up to the gate to leave, before I could even put the ticket in the little thing, the gate opened. There was a woman standing right by the gate, and I said, "Darn! If I had known the gate was open, I could have saved $4," kind of kidding with her. And she said, "Oh, no. It recognized your license plate. It knows you've already paid." I went, "What?!" And sure enough, there was my license plate number printed on my ticket. Elon Musk says that A.I. could very well destroy us one day, and not even maliciously -- just because it's more logical. One day, somebody is going to have to decide, "I'm going to pull the plug on the grid." Let's think about how many things online we depend on, and if we'd be sort of lost. We get a small taste of that whenever we have blackouts after hurricanes or other catastrophes. Herthum: I happened to be in Baton Rouge after Hurricane Katrina hit, and after four days of watching that debacle on television, we snuck into New Orleans. Let me tell you something -- a modern American city can feel post-apocalyptic. There were dead bodies on the street. And at night, it was frightening -- the gunshots, the smell. Hopefully you've never had the displeasure of smelling a dead human body. It was just ghastly. So if everything shuts down, what do people do, when they realize they haven't prepared themselves? If AI decides something's not a good idea -- just like in 2001: A Space Odyssey, [imitates Hal] "I'm sorry, Dave, I can't do that" -- it can get very spooky, very fast. Your very first day on set was the cold storage scene. How did you decide to do the full Monty for that? Herthum: "Welcome to Westworld! Please disrobe and walk through all these naked people." So it was my first day, it was Timothy Lee DePriest's first day, and I've had to wear the banana bag before -- that's what's printed on the thing, believe it or not -- so I knew the whole routine. Timmy shows up, and we were getting our faces made up, and he goes, "Louis, what is this?" and he pulls it out of his pocket, and I said, "That's your wardrobe, brother. It's an option, you can do it or not. Apparently, there are going to be quite a few other people who are completely naked." And he said, "Are you going to do it?" And I said, "Well, I don't care. If you want to, we'll do it." "OK, let's do it." So we are completely naked. Simon Quarterman, who plays Sizemore, chose to go the full Monty in episode one this season, and I applaud him. I know that Katy Perry came up to him at the premiere party and said, "Nice package!" My sister said that to him, too, and the look on his face! He was like, "Oh. Well. Thank you." Whatever happened to Dolores' mother? Herthum: [Laughs] Yeah! We never really see her, except when she's dead on the floor. And you don't even see her face. I have absolutely zero information on Mrs. Abernathy. You're so good at the glitching movements. Have you ever been to Chuck E. Cheese or gone somewhere like that to study animatronics movements? And if they were ever doing a live-action Chuck E. Cheese movie, would you be up for that? Herthum: [Laughs] Once, like a gazillion years ago? I think it was a friend's kid's birthday party? Maybe in the '80s? But I've never taken my daughter to a Chuck E. Cheese. That's very funny, but no. I don't even know how they move. When I went in to audition, I hadn't worked out too much of the robotic stuff. And then [casting associate] Deanna Brigidi said, "We want you to come back, and bring us some more physicality. Let us see the trouble that this host is having. Do you know when your computer gets that spinning ball? That's what's happening to you." So when I was going from one character to the next, if one character crossed his legs during the scene, I would be trying to cross my legs and glitching. And I realized that he's not just physically glitching, but also the audio functions. That's when the hiccupping thing happened, like he's trying to talk but he's out of breath. After I finished the second audition, Lisa Joy said, "That was freaking awesome! Is there anything else you want to show us?" And I said, "I think I'll quit while I'm ahead." So, since we've been talking about theories for Westworld, I have a theory for you for a former show of yours, Murder, She Wrote. Some fans think that Jessica Fletcher was really a serial killer. Herthum: [Laughs hysterically] Oh my God! I have never heard that! I love this. Because if you examine how many people were living in Cabot Cove, and how many murders occur there every year, their murder rate is the highest in the world. How does this one person keep stumbling into all of these cases? Is she actually doing the killing all along? And you might actually be partly responsible for her running amok, since you were the deputy and you never suspected her. Herthum: [Laughs] Have you ever heard Angela Lansbury address this? I've got to tell her. I'm sure she would get a kick out of it. Of course, I've heard that Cabot Cove is the murder capital of the world, and if you see Jessica Fletcher coming, run! Wherever she goes, someone dies. I sent Ron Masak [who played the sheriff] an email just last week: "Do you think we'll ever do a reboot?" And he wrote me right back; "Ran it by Angie, and here's her reply. 'It's a great idea, but at almost 93, not up for it.'" Or something like that. But wouldn't that be... Just do a two-hour Murder, She Wrote movie, where Angela is found to be the one doing all the murders! [Laughs] And I would make the arrest, because by now, I'd be the sheriff, and Ron Masak would be the mayor. Yeah. God, that's so funny. Well, I know all the producers, I stay in touch with them, so I'll run it by them. Maybe they can coerce Angie to come in for a couple of days. [Laughs] Even to do it as a parody. Just a short 10-minute Funny or Die thing would be hysterical!